Nu Master® Fluid Acrylic Paint offers highly pigmented intense colors with a thin consistency making them ideal for applications which require thin, yet highly concentrated color. Colors dry to a permanent, lightfast, flexible and water resistant semi-gloss finish. Use on many surfaces such as paper, fabric, wood, plastic, glass, cardboard, metal and canvas. Clean up with soap and water. 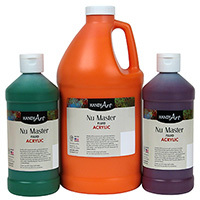 Nu Master® Fluid Acrylics are certified AP non-toxic.